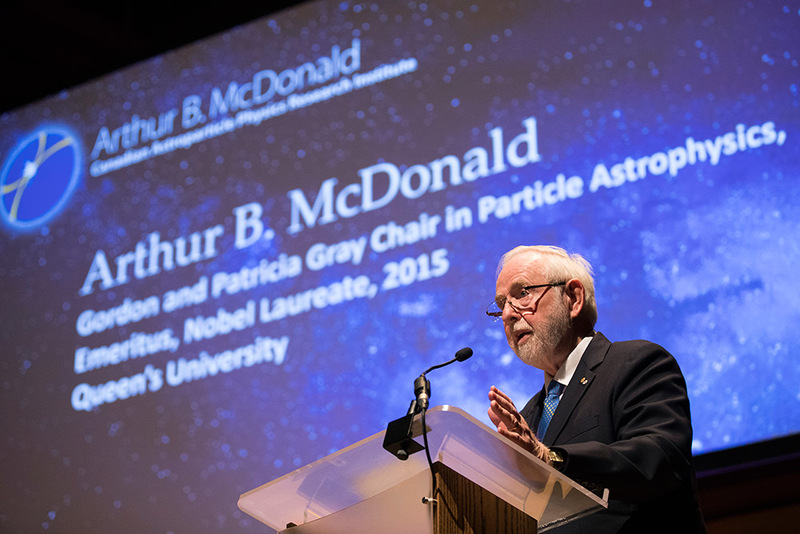 The Arthur B. McDonald Canadian Astroparticle Physics Research Institute will advance scientific research and discovery in astroparticle physics. Queen’s University is cementing its reputation as a world leader in astroparticle physics with the official launch of a new national research network dedicated to understanding some of the universe’s deepest mysteries. The new Arthur B. McDonald Canadian Astroparticle Physics Research Institute is a partnership of eight universities and five affiliated research organizations. Headquartered at Queen’s, the institute came to fruition as a result of the $63.7 million investment the university received in 2016 from the Government of Canada’s Canada First Research Excellence Fund. Over the past year and a half, the institute has been building momentum, appointing a scientific director and recruiting 13 new faculty members (out of 15 designated positions) from around the world. In total, 100 people, including faculty, staff, and students across the country will be members of the institute, all working to advance its research and outreach goals. In addition to advancing research into areas such as the mysteries surrounding dark matter and neutrino science, the institute has a mandate for scientific outreach and to develop unique undergraduate and graduate student programing and opportunities. "Although the dimensions of the particles we are studying are minute, the implications of these discoveries are monumental and fundamental to the very properties of science and our understanding of the formation and evolution of the universe." Along with the official launch and naming, the McDonald Institute also unveiled a new Visitor Centre located in Stirling Hall at Queen’s along with a new website. The Visitor Centre will feature a virtual reality setup that will allow guests to travel though space and experience a solar storm. The centre will also have an augmented reality sandbox that will teach guests about gravitational fields in an interactive and tactile manner. "With SNOLAB, Canada has become an international centre for the experimental elements of astroparticle physics. Our new Institute adds to that strong international capability through the development of a strong personnel component within Canada – it has created a new generation of researchers in this field. Additionally, the Institute creates an intellectual centre for interaction between theorists and experimentalists on topics at the cutting edge of particle astrophysics. This is already resulting in a number of experiments at the forefront of topics that will help us to understand the world around us and how it has evolved. With the Institute, I am convinced that this will continue and keep Canada and Queen’s as a leader in this area of research."